APSWREIS DCO, Principal, TGT, Warden Posts Recruitment Hall tickets 2019, APSWREIS DCO, Principal, TGT, Warden Posts Recruitment Exam Dates 2019. 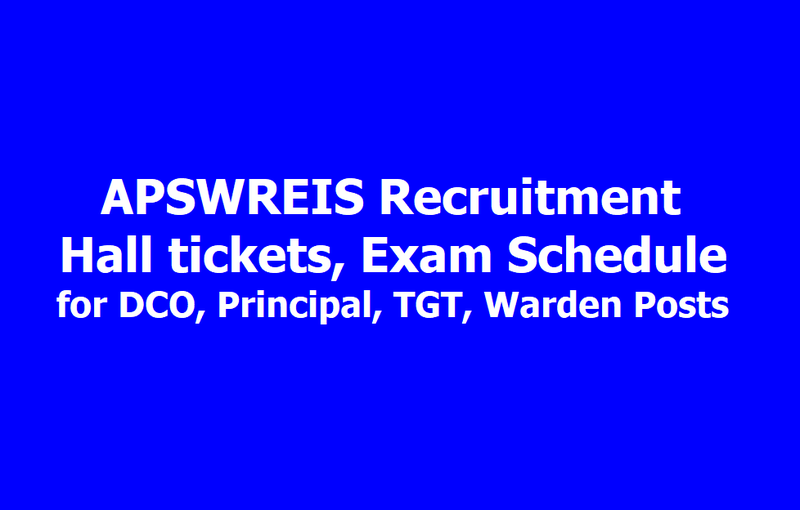 APSWREIS Recruitment Hall tickets 2019. APSWREIS Recruitment Exam Schedule 2019. APSWREIS issued the Direct Recruitment notification for appointment of DCO / Principal Grade-II / Trained Graduate Teacher / Caretaker (Warden) in the Institutions run by APSWREI society in the State. Applications were invited from the eligible and interested candidates through online mode. APSWREIS has released hall tickets for DCO / Principal Grade-II / Trained Graduate Teacher / Caretaker Posts Recruitment Exam, which would be held on the following exam dates. APSWREIS Recruitment Exams start from March 28. Candidate who were applied for this Direct recruitment for appointment of DCO, Principal, TGT, Caretaker through direct recruitment, they can download the hall tickets from the official website. Note: For the candidates who have not booked exam city/center, APSWREIS will try to allocate their home district or near by district if available. Candidates will be informed through our website/Social Media/SMS for allotment of examination Centres and downloading Hall Tickets. The Candidates will have to down load the same as per the instructions. 1. Selection will be purely based on marks scored by the candidates in online exam. Weightage marks as indicated in this notification will also be counted for this purpose. 2. English Language Proficiency Test (Part-I) is for 50 marks and 30 marks is the qualifying marks. Part-II of the Candidates who failed to secure qualifying marks in Part-I will not be considered. It is further clarified that, marks secured in Part-I (i.e., English Language Proficiency Test) will not be considered for final merit list. This (English Proficiency Test) is not applicable in case of candidates applying for the posts of TGT Hindi and TGT Telugu. 3. In case of TGTs, 80% weightage for the selection will be given for the marks obtained in Part II of the Written Test and 20% weightage will be given to the APTET Paper-II Score. If the Candidates appeared for TET more than once, the highest valid score will be taken into consideration. 4. No Demo/Interview will be conducted for selection.